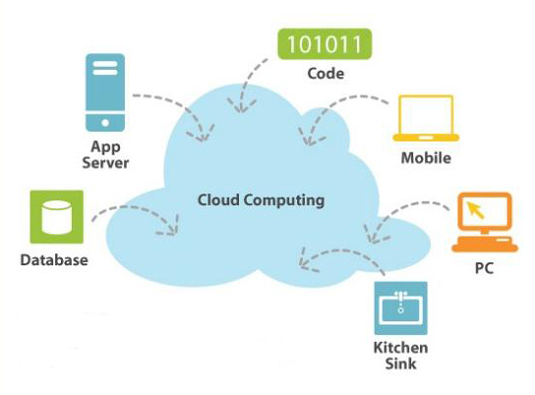 Cloud computing is computing that involves a large number of computers connected through a communication network such as the Internet. It relies on sharing computing resources rather than having local servers or personal devices to handle applications. In cloud computing, the word cloud is used for “the Internet,” so cloud computing means “a type of Internet-based computing,” where different services — such as servers, storage and applications — are delivered to an organization’s computers and devices through the Internet. We need not to install software on our local PC and this is how the cloud computing overcomes platform dependency issues. Hence, the Cloud Computing is making our business application mobile and collaborative. Web based email are the simplest example of cloud computing. Web-based email services such as Gmail, Yahoo, Hotmail came along and carried email off into the cloud. We know that emails can be stored and processed through a server in some remote part of the world, easily accessible from a Web browser. Another example is search engine, when we type any query on search engine like google, our system does nothing in searching query but search is done by Google’s hundreds of thousands of clustered PCs, which dig out your results and send them promptly back to you. One can access the application as utility over internet. It is on demand based. Lower upfront cost and infrastructure cost. It is reliable, flexible and highly efficient. Online development and deployment tools are available. Ongoing operating cost may be high. Dependency on service provider, difficult to switch from one provider to other. Security and privacy issue because of third party involved. The risk of the failure of isolation mechanism that separates storage, memory, routing between the different tenants.